It's not so crazy here that I haven't noticed I need to plan for something to knit on the train to Ottawa in a couple of days. Five hours of a soft seat with a window view - of course I need knitting! I booked Business Class so I'd have wi-fi and a reserved seat with a power outlet and a lunch I don't have to plan for... so probably I should use the time to source more stuff for the house. But I am going to try very hard not to. I had a fantastic, and very warm, black and grey scarf I used to wear with it, but do you think I can find it since the move? Of course not. Seriously though, I need to knit myself another of these in a colour that goes with a scarf or three. 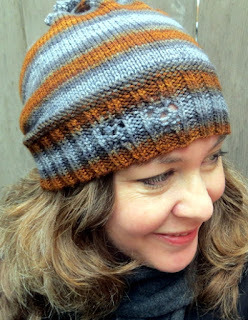 It's dead easy - if you leave out the lace panel, which I like because it helps me figure out where the front of the hat goes, you're basically knitting a tube with eyelets at the end for a drawstring. It is the PERfect knit for a train ride and audiobook. Or I could finish the grey lace gloves. Or I could finish the hat I started for Bob, since Bob lives in Ottawa and I will see him and he would probably appreciate a warm hat this week. Or... I could look for yarn and my 3.5mm circular needles. I guess it all comes down to how selfish I am feeling. Think good packing thoughts for me, won't you? And have a great day! I think you need to take all the projects you mentioned, you never know what kind of knitting emergency may arise. You could find yourself without appropriate knitting and that would be a catastrophe.